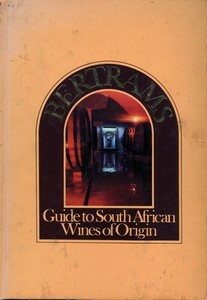 Published by Bertrams Wines Ltd. in Cape Town in 1976, dis well-produced book gives a brief background to the history of South African wines, an introduction to the wine of origin legislation, a good explanation of the Cape wine areas, and the wine estates and grape cultivars then grown at the Cape. It also carries the only full map of the demarcated wine areas in the Winelands. Furthermore, there are chapters on the legal requirements for wines of origin, the advantages of the legislation, and also a chapter on the general charactristics of Cape cultivar wines. This, one of the first books on Cape wines and the first dealing with the wine of origin legislation, the Cape wine areas and the wine estates and grape cultivars then grown at the Cape during the early 1970s, is now a rare collectors items. The outstanding colour photographs were taken by Chris Jansen and the pictures of the different grape varieties by Terence McNally.